Who is posting video online? One in seven adult internet users (14%) has uploaded a video to the internet so others can watch it or download it. 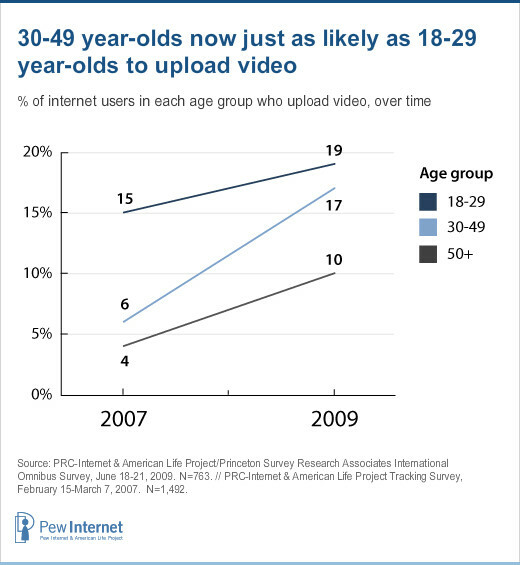 That is almost double the 8% of adult internet users who were uploading video in 2007. One in five adults who watch video online (21%) also post video online. Video uploading is more common among internet users under age 50 than is it among older internet users. Roughly one in five internet users age 18-49 (18%) have uploaded a video online, while the same is true of just 10% of internet users age 50 and older. While 2007 data also showed that young internet users were most likely to upload video, the activity was concentrated among 18-29 year-olds. Today, 30-49 year-olds are just as likely as the youngest adults to upload video. As is the case with video watching, home broadband access is a key driver of video uploading. Overall, 16% of broadband users upload video. 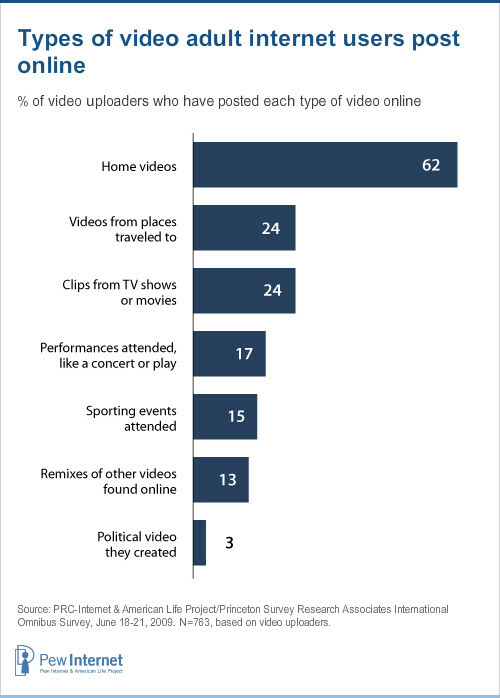 Among internet users who upload video, 91% have broadband at home. Education also has a notable impact on an internet user’s tendency to upload video; internet users with at least some college education are more likely to upload video than are those with less education (17% v. 11%). 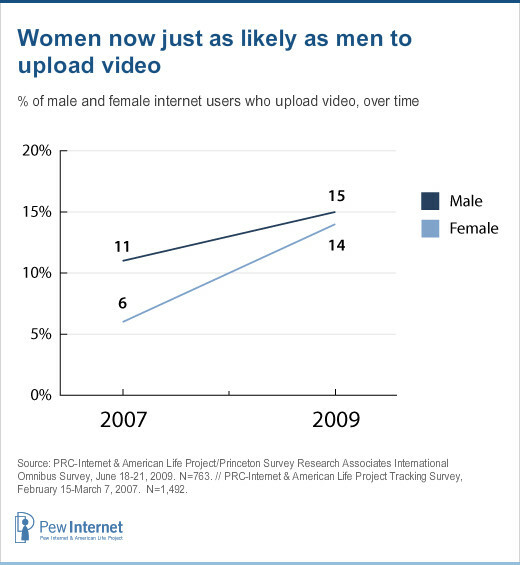 In 2007 Pew Internet found that men were twice as likely as women to post video online. Today, that disparity no longer exists; male and female internet users are equally likely to upload video. Where and what are adults uploading? We asked uploaders if they post video to six different types of sites. 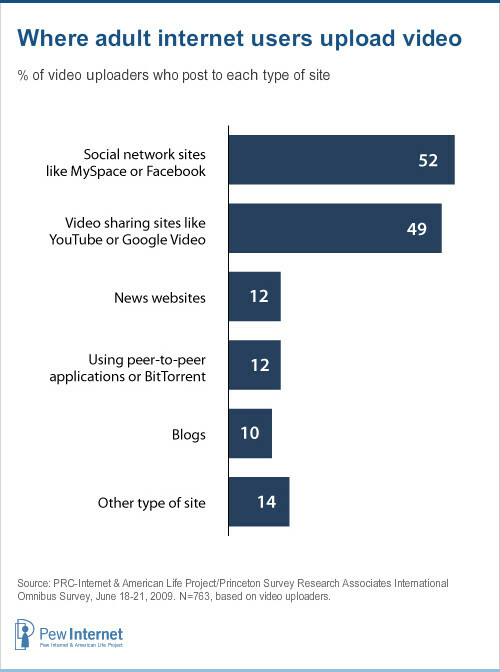 By far, among the choices presented, the most popular sites for video uploading are social networking sites like MySpace or Facebook (52% of uploaders post video on these sites) and video-sharing sites like YouTube or Google Video (49% of uploaders post on this kind of site). We also asked video uploaders which, if any, of eight different types of video they have posted online. By a wide margin, the most popular content to post online is home video, uploaded by six in ten video uploaders (62%). About a quarter of video uploaders post travel videos (24%) or television/movie clips (24%) online. The small number of video uploaders in our sample prevents us from being able to look at subgroup differences where uploading behavior is concerned. Among video uploaders, there appears to be considerable variation in terms of who they share their videos with, who they believe is watching, and concerns about how the video they post may be used. When uploaders are asked if they place restrictions on who can access the videos they post, two clear camps emerge. One in three uploaders (31%) say they “always” place restrictions on who can access their videos, while 50% say they “never” do this. The remaining 19% fall somewhere in the middle. At the same time, the majority of video uploaders are not concerned that someone might copy or use their video without permission; 37% say they are not concerned at all about this, and another 31% say they are not too concerned. Just 15% of uploaders say they are very concerned about potential copy or use of their video. It appears that most video uploaders are not abusing copyright in a way that draws attention from copyright owners. Just 4% of video uploaders have received notice that a video they uploaded included copyrighted material. The current survey also reveals that most internet users believe that others are not uploading videos of them without permission. More than nine in ten internet users (96%) say that as far as they know, no one has uploaded video that was taken of them without their permission. 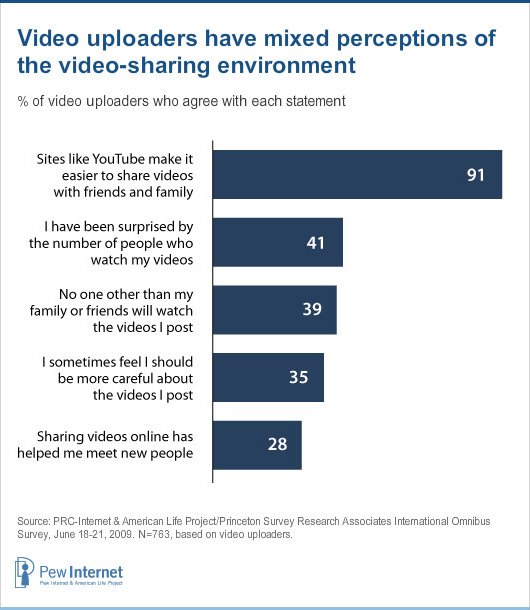 To measure uploaders’ perceptions of the impact of the video-sharing boom and the fairly new video-sharing environment, we asked if they agree or disagree with a series of statements. The results reveal that uploaders almost universally appreciate the ease with which video sharing sites allow them to share videos with family and friends, but a considerable number also feel they should be more careful about what they post. And while many express the belief that only people they know will see the videos they post, and equal number of uploaders say they are surprised by the number of people who watch their videos.